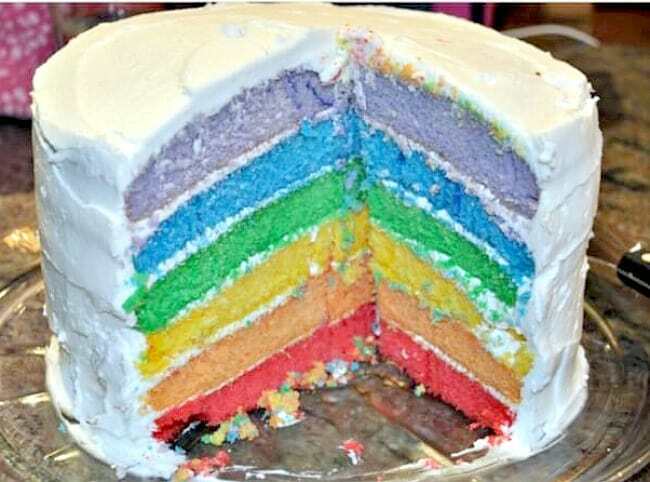 Rainbow cakes look so cool when you cut into them and all of those brightly colored layers are exposed! But how on the earth do you get those vibrant colors without using up bottles and bottles of food coloring? You just have to use the secret ingredient! (And the right food coloring of course!) 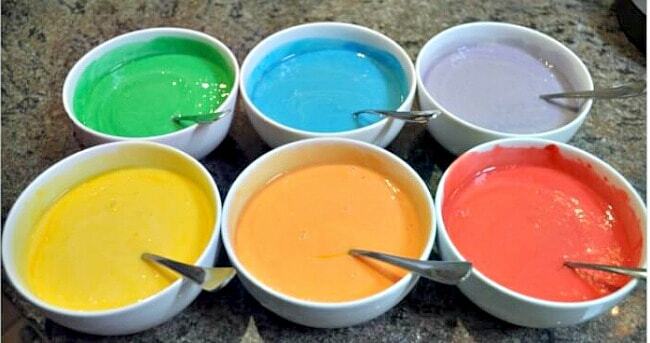 Here's how to make a rainbow cake for dessert tonight! Since the cake will have six layers, you'll need six of same sized round cake pans This is an affiliate link: MomOf6 earns a commission if you purchase, at no additional cost to you. , or you'll need to bake the layers in shifts- taking the time to let each layer cool before removing it from the pan and cleaning the pan thoroughly. 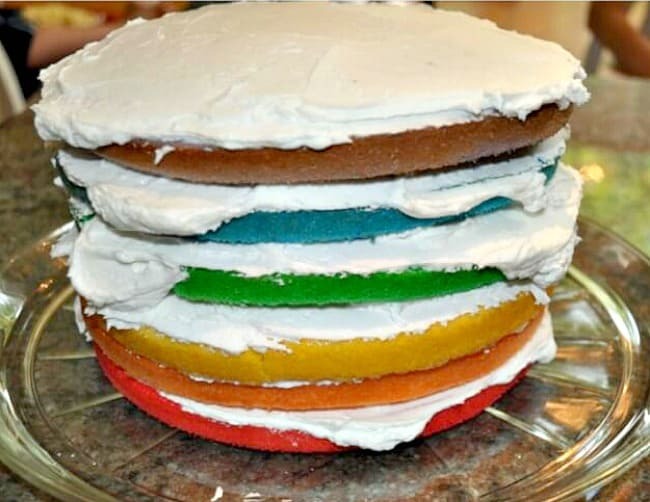 Trust me- it's easier to bake all six layers at once ( and these are my fav This is an affiliate link: MomOf6 earns a commission if you purchase, at no additional cost to you. )! 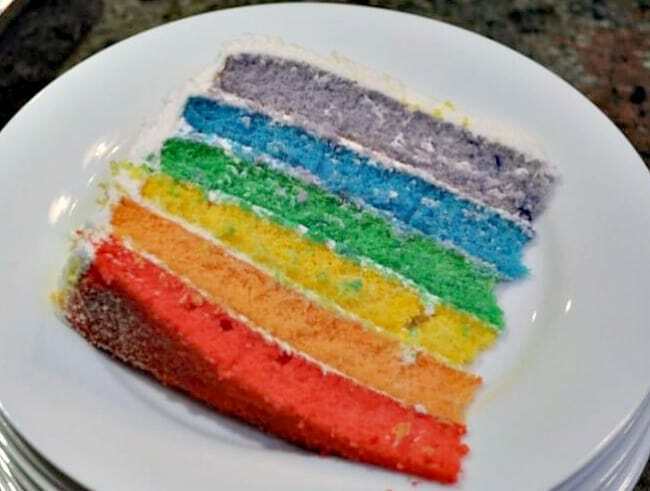 How to Make a Rainbow Cake so Bright! You can use your favorite white cake recipe, or keep it simple and just use two boxes of a store bought vanilla cake mix and prepare the mixes (one at a time) according to the instructions on the back of the box. Your next step is to divide each batch of cake batter into three bowls making sure to fill them as evenly as possible. Use gel food coloring This is an affiliate link: MomOf6 earns a commission if you purchase, at no additional cost to you. (rather than the liquid food coloring you buy at the grocery store) to get the brightest results. You only need a tiny bit- I use a toothpick to extract a small amount of each gel color- and then mix it well before deciding if I need to add more color. A little goes a long way! 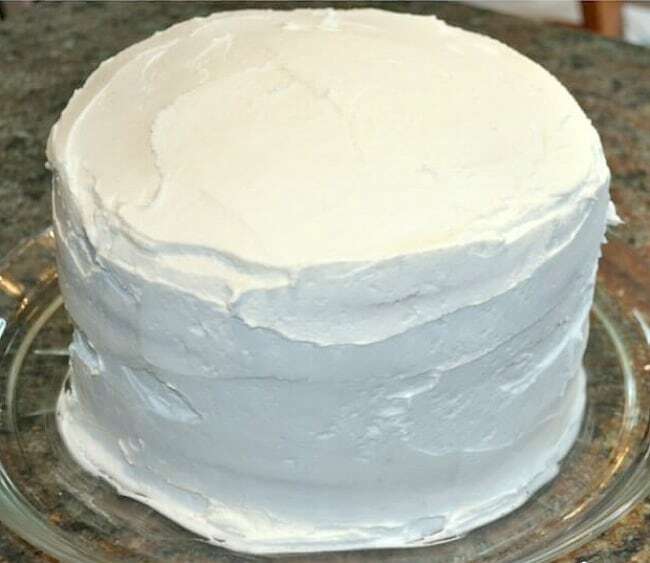 Frost the top and the sides of cake with the remaining buttercream frosting. 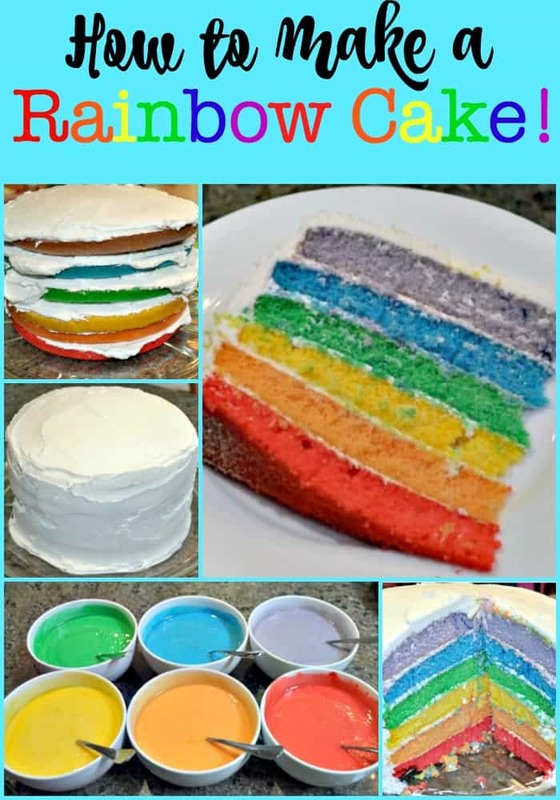 You can even make it all fancy with a bit with rainbow colored sprinkles or even bright fondant polka dots- but I love the simplicity of the stark white frosting on the outside of the cake, knowing the rainbow surprise that is hidden within! I am sure that your kids will be as thrilled with this cake as mine were! 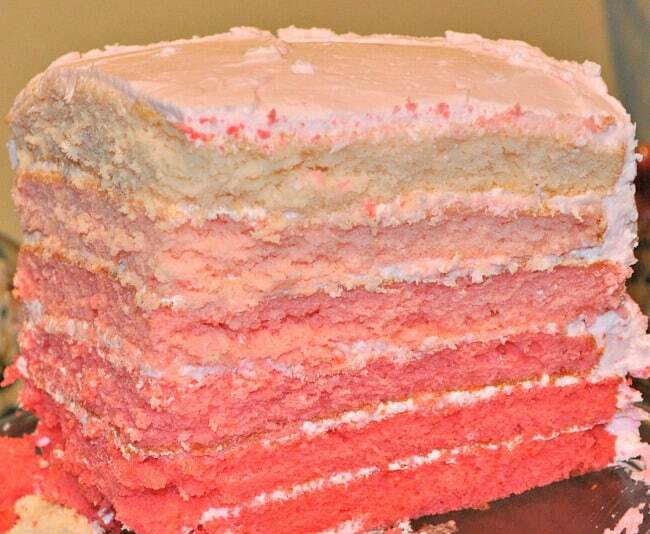 You can also use this same tip to create an Ombre Cake! In this case, I simply added greater amounts of gel food coloring to each bowl to achieve the variations in color. I continued the ombre theme through to the frosting- mixing three different degrees of color- frosting each of the three variations on the outside and then blending them together. It looked so beautiful inside! « 5 Reasons to Visit Mammoth Cave with Kids! Wowza! The cake looks amazing. I just smile every time I look at the picture of it:) Did you purchase the gel food dye at Stop n Shop? The gel food dye can be found at Party City in the aisle where they have cake pans and cupcake toppers, etc. Or you can of course buy it online from my favorite site: Amazon! 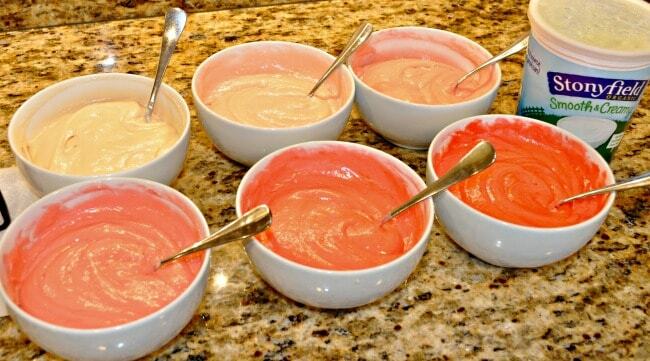 But as long as you make the batter with the 1/3 cup of yogurt added in, you will likely be able to achieve the same colors using regular food coloring, like you find at the grocery store! This one’s a beauty! I, too, love the plain white frosting on the outside. My daughter turns 4 this month…maybe I’ll surprise her with this! We have two birthdays here this month too…. the 10th and the 12th! If you bake it- include a picture on your blog! I would love to see it! I’m making a list of all the things we’ll want to try when we get there next week. This looks GREAT! Yes, I can imagine the kids loved it. Especially Lili, with all that frosting!! 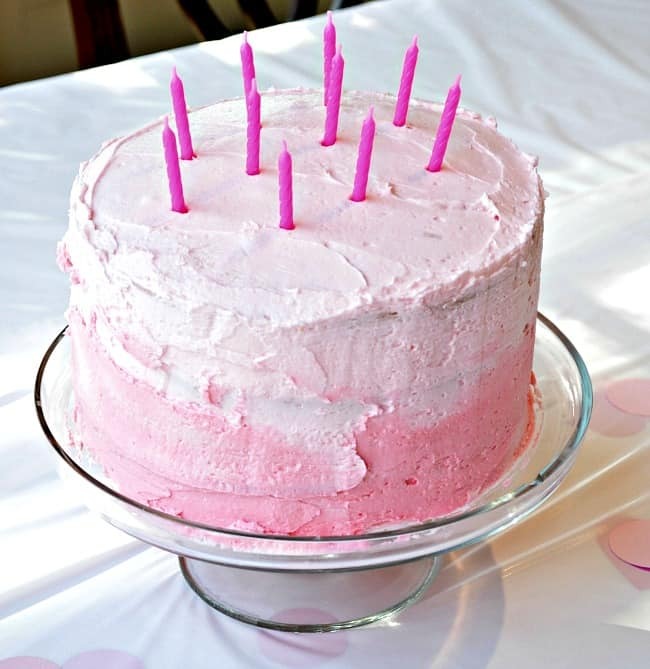 I am trying to convince Lili that this should be her birthday cake…. we’ll see if she goes for it!